Updating the job numbers with the new numbers that are out today continues to show that virtually all the jobs created this year have been part time jobs. So far this year there have been 848,000 new jobs. Of those, 813,000 are part time jobs (for both economic reasons and noneconomic reasons). As can be seen in the above screen shots from the BLS.gov, the total part-time jobs changed from 26.437 million in January to 27.250 million in August. To put it differently, an incredible 96% of the jobs added this year were part-time jobs. (It isn't clear to me why we see the differences in part time for economic and noneconomic reasons.) However, these numbers raise a question about whether the employer mandate that has already been forcing some companies to move to part-time workers so as to avoid government imposed penalties is having a significant impact. Might the relationship between the recent part time jobs and overall job growth be stronger as we were getting closer to what people thought would be the implementation of Obamacare's employer mandate? Might we now see a divergence with the very recent one year delay in the employer mandate? Or was the 2012 election the defining event for firms to begin to study the impact more? Data from the BLS.gov. UPDATE 4: Using the sum of the part-time economic and noneconomic reasons. The relationship that appears to exist this year seems interesting. UPDATE: The BLS.gov also provides a sum of these two numbers (available here) where they get a total of 532,000 (thanks to the "Department of Numbers" for pointing this out and to Nick for emailing me about their post). That implies that 63% of jobs added this year were part-time jobs, which is still an amazingly high number. Department Numbers uses this number Total Part Time Workers (LNS12600000) rather than the sum of the Part-Time for Economic Reasons (LNS12032194) and Usually Work Part Time Noneconomic Reasons (LNS12005977). At least part of what is going on has to do with the seasonal adjustment of the components produces a different result than seasonally adjusting the total. I can't see any reason that looking at the total makes more sense than looking at the sum of the two components. Indeed, a strong case could be made that it is better to seasonally adjust the components and not just the total. In any case, whether it is 63% or 96% or someplace in between, it is still a large portion of the increase in jobs that is due to part time employment. Steve Bronars, a friend and a labor economist, argued that the most useful comparison might be to look at only Usually Work Part Time Noneconomic Reasons (LNS12005977). In that case, there was an increase in part-time workers of 875,000, but only an increase in jobs of 848,000. 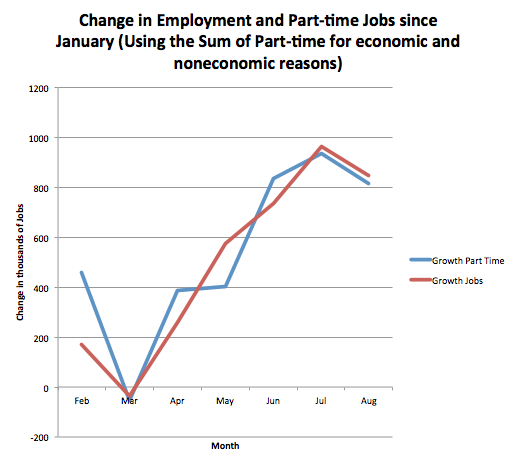 Thus, the increase in part-time jobs equals 103% of the increase in jobs from January to August. UPDATE 2: Ben at the Department of Numbers now says that the percentage using Table A-6 is 59%, not 63%, but that is using a different time period. It is easy to verify the 63% using the "total part-time" number for the change from the beginning of the year (January through August) (63% = 532,000/848,000). 532,000 = 27,999-27,467. 848,000= 144,170-143,322. It seems pretty clear to me that the number to compare the 96% to is 63%, not 59%. UPDATE 3: Tyler Cowan writes: "As Ben Engebreth points out, based on these BLS charts, the correct number seems to be 59% not 96%, though the higher estimate does still seem to hold in Lott’s (more cumbersome and less transparent) sources." But he provides no explanation for why this should be correct nor does it appear that he has checked the issues discussed in this post. You are conflating changes in part-time/full time composition of jobs with changes in the level of jobs. 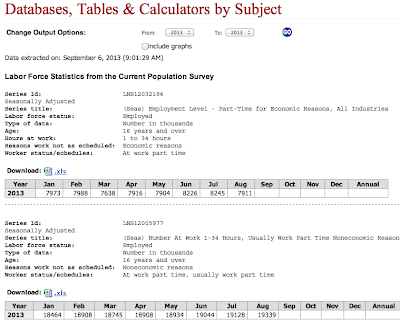 Nowhere does the BLS state: 96% of the jobs added this year were part-time jobs. On an unadjusted year over year basis, the composition of part-time jobs for economic reasons are down about 2%. The importance of part-time jobs as a percentage of total job growth has been increasing over time. Ummm.... who's in charge of the math here? If you start with 10 million full-time workers, create 1 million new full-time jobs, and reduce 1 million existing jobs from 40 hr/wk to 36 hr/wk you end up with 100% of new jobs created were part-time jobs. Which is completely misleading. As an indicator of job growth, job creation, or *anything* meaningful this metric appears a complete waste of time. 1. The green line is "Usually Work Part Time Noneconomic Reasons"
2. The blue line is "Slack Work or Business Conditions"
3. The red line is "Could Only Find Part-Time Work". Since 1995 the green line has trended downwards slightly, the blue line spiked upwards during the Great Recession and has trended down since, the red line spiked upwards during the Great Recession and slightly trended upwards since. Conclusion: Involuntary part-time employment has not been increasing over time. Voluntary part-time employment increased during the Great Recession and in combination (red and green lines) has been slowly declining since. This much ado about nothing, indeed. Why should we be surprised? Bank regulations which allow banks to earn much higher risk-adjusted returns on equity when lending to “The Infallible”, than when lending to “The Risky”, can only produce fatty tissue, and not the muscles required to engineer a new generation of sturdy jobs… that requires risk-taking and does not allow for excessive risk-aversion. These regulations should not be allowed under Regulation B, but no one wants to enforce that. John Lott your post is completely dishonest. Shame on you. Would you mind explaining what exactly is dishonest about the data that I present? If you look at the seasonally adjusted data you get your results. I suspect there is some problem with the seasonally adjusted -- especially since the seasonally adjusted January observation is lower than every single observation in 2012. 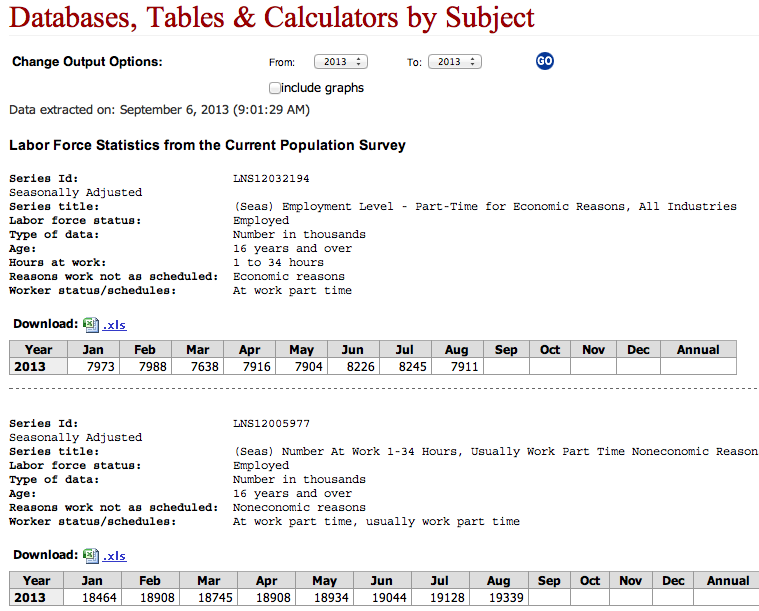 How can you talk about job growth in 2013 without once using any 2012 data. I always thought growth rates were computed from one year to the next, not within a given year. Second, the January observation appears to be a flukish data point. Part time employment in January 2013 was lower than in any month of 2012.
of 2012. This is particularly true if you look at January. 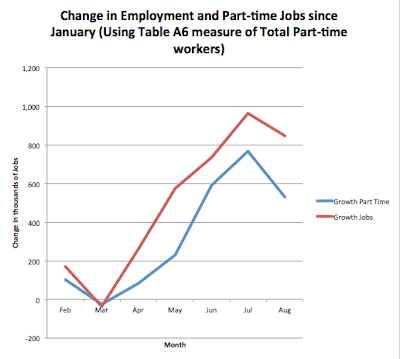 January 2013 part time employment was 483,000 lower than in January 2012. January 2013 part time employment was less than in every month of 2012. It sure looks like January 2013 is an outlayer observation . While your math may be correct, Your results are strictly a function of the January data point being a weird number. It looks like the seasonal adjustment for January 2013 created the weird observation. By the way, unpublished BLS data show that federal employees accounted for over 100% of the 2013 increase in part time employment. From January thru August of 2013 private part time employment was less than in the same months of 2012. So the 2013 jump in part time employment was due to the sequester, not Obama-care. Ill be happy to send you the unbublished data since the BLS is shut down.